This is the first Amway Attitude Lipstick that I used. I have been to my native place last week and found this in my sissy’s stash. The shade is Natural Pink. The packaging is strong and classy in black. Price: Rs.209 for 4.5 gm. Ingredients: Castor oil, Capric/Capryllic trigylceride, octyl methoxy cinnamate, candelilla wax, octyl palmitate, trisostearyl citrate, lanolin anhydrous, aceytylated lanolin alcohol, ozokerite wax, benzophenone 3, microcrystalline wax, carnauba wax, PVP/Hexadecene copolymer, shea butter, almond oil, jojoba oil, fragrance, bees wax, propyl paraben, tocopheryl acetate, BHA. 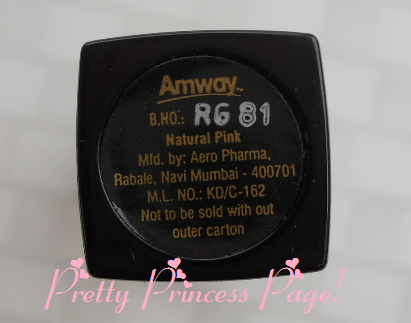 The shade is natural pink and is suitable for fair skin tones. It is well pigmented and a single swipe shows off decently. It does not dry the lips and is sufficiently moisturising. Staying power: It stays only for about 2 hours and then fades away. Texture: It is creamy and glides smoothly over the lips. It does not melt even in this hot summer in South India. It settles on the lines on lips. I like Amway lipsticks. Though this is not my kind of shade, I want to try some other colours. Haven't tried Amway makeup yet 🙂 But I like the packaging. amway lipsticks are not long lasting…nice review….